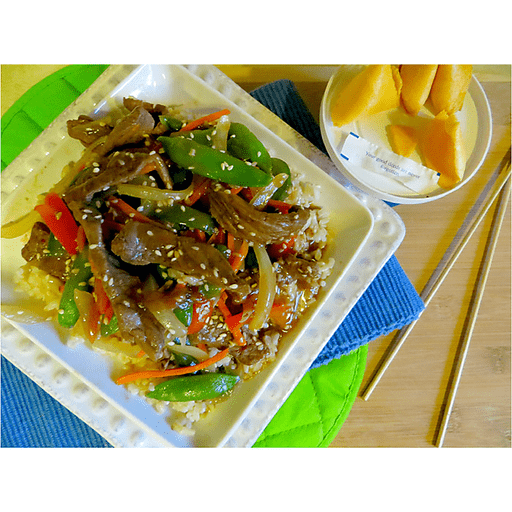 Customizable to your own taste preferences, stir fry incorporates any lean protein (in this case, top round steak) with a handful of vegetables (pea pods, sweet peppers, matchstick carrots, onion, etc! ), really whatever you have on hand can make this tasty, easy dinner dish! 1. Mix broth, cornstarch, soy sauce, sugar, garlic, ginger and red pepper in small bowl until smooth. Set aside. 1. Heat oil in large nonstick skillet on medium-high heat. Add steak in batches. Stir fry 5 minutes or until cooked through. Remove from skillet. Add vegetables to skillet. Stir fry 3 minutes until tender-crisp. Return beef to skillet. 1. Stir soy sauce mixture. Add to skillet, stirring constantly. Bring to boil on medium heat. Boil 1 minute or until sauce is slightly thickened. Sprinkle with sesame seeds. Serve with cooked brown rice, if desired. Calories 230, Total Fat 11g (Saturated 2.5g, Trans Fat 0g), Cholesterol 55mg, Sodium 710mg, Total Carbohydrate 12g (Dietary Fiber 2g, Sugars 5g), Protein 20g, Vitamin A 80%, Vitamin C 50%, Calcium 4%, Iron 10% *Nutritional values are an approximation. Actual nutritional values may vary due to preparation techniques, variations related to suppliers, regional and seasonal differences, or rounding.